To the Diocese of Juneau! It’s your favorite seminarian, James Wallace, fresh from the arduous, and longlasting seminary of Chicago. What a year 1st theology has been: Christology, moral theology, doctrines of the Holy Trinity, on and on the academic year has been filled with enormous blessings. I thank you for your prayers (we’re always in need of them), and will encourage you to continue praying for vocations for our Diocese. Your prayers are working because we now have two — two (that’s 1/4 of our ordained priests) young and driven men studying for this Diocese, so please continue to keep us in your daily prayers. And, of course, I’d be remiss if I didn’t ask for your prayers for the incoming Bishop of our Diocese. We’re in need of steady and focused leadership, and our communal prayers will bring us so many great blessings once he arrives. I’m pleased to announce that I’m serving the Diocese at St. John-by-the-Sea in Klawock, Prince of Wales Island, for this Summer. 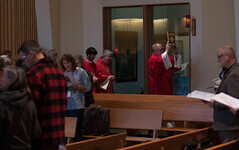 In 2013, it wasn’t uncommon to see one person attend daily Mass. Can you guess how many were there this morning (June 21st) when I served? Five! 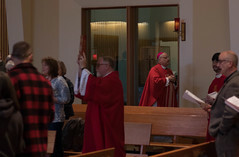 Five souls up from one, in a tucked away corner of the Diocese, and we’re seeing continued fruits in Juneau, Sitka, and Ketchikan. Father Ed Penisten is doing a fantastic job here in POW, and speaking personally, there’s nothing which illuminates a priest’s heart more than seeing many souls come to daily Mass, and I implore you — seek Jesus in the Eucharist! Everything comes together when you are there: family, friends, eternity, concerns, everything. Seeing Jesus in the Eucharist is what galvanizes the soul, and makes us glow, so please — seek the Lord intimately in daily Mass (whenever you can).